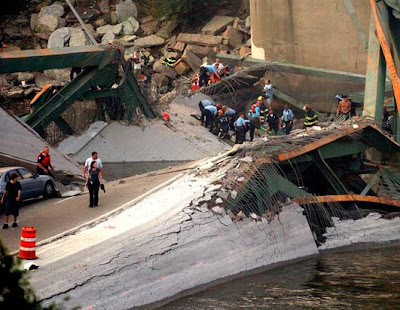 LiteVi: Collapsed Bridge! How Do You Feel? Collapsed Bridge! How Do You Feel? Can you imagine … getting up in the morning, following your normal morning routine, going to work, then finishing out your day and looking forward to getting home. Then all of a sudden everything changes. What you only imagined or you only see on television actually happens to you. 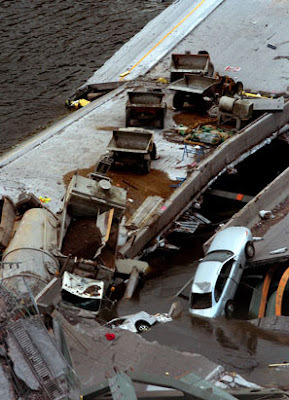 One minute you are riding along listening to your favorite song, or telling your kids to pipe it down, or just mentally planning your evening and the next you are on a collapsed bridge with cars falling below into water and destruction. That is what happened to everyday folks in Minneapolis yesterday evening. The whole thing makes my woes inconsequential when you think about the devastation that those people have to face, some lost their lives, some are hurt, and others narrowly escaped but not without pain. Looking forward to the future, it is hard to imagine how those individuals will ever brave a bridge again. I only heard about it and had palpations on my way to work today when I had to cross over a bridge. It is a mindless thing that I do everyday but today, I hesitated and my foot faltered on the accelerator as a picture of the concrete rubble flashed in my head. There are so many questions that a person can ask about the incident. How did this happen? Was there an earthquake? How many people are hurt? How many are dead? How did the bridge collapse? In the midst of the hows and before the blame game starts, let us all remember to pray for all those that are involve including those that have to respond to the situation. Not to sound cheesy but I am sure I will, we are resilient people and will always come out better than before. However, it does force us to put things into perspective. Imagine if your loved one was in a similar situation? How would you feel?